When you think of the best gaming keyboards, what comes to mind? Do you think of giant RGB behemoths with lightning-fast mechanical switches, with all the bells and whistles? Or do you think of an even balance between price and performance without going overboard on unnecessary features? We here at TechRadar are squarely in the second camp, and keyboards like the Acer Predator Aethon 500 are kind of perplexing to us. This is because, while it is generally a competent keyboard with extravagant RGB lighting and all the macro keys and volume knobs you could ask for, its high-price tag and low-budget key switches sour the deal significantly — especially at its high price point. The Acer Predator Aethon 500 isn’t an awful keyboard by any means — it’s functional and stylish enough to impress most people. It’s just that it’s hard to recommend at this price point, when there are so many other keyboards to choose from. The Acer Predator Aethon 500 is available now for $179 (£199, AU$299). That’s a lot to ask for a gaming keyboard, especially one with Kailh Blue switches. These switches are generally found in inexpensive knock-off keyboards, and generally imitate Cherry MX Blues. These switches aren’t bad on their own, just disappointing at this price point. For the same amount or less cash, you can get some of the best gaming keyboards around, like the $199 (£199, AU$339) Razer Huntsman Elite or the $159 (£149, about AU$200) Roccat Vulcan 120 Aimo – both of which are premium keyboards with all the bells and whistles, that don’t compromise on the quality of the mechanical switches. We spent a lot of time trying to figure out why this keyboard is so damn expensive, and we keep coming up short. Maybe it’s the Acer Predator branding, but we’re not sure that it has the audience or the aesthetic to demand such a high price tag. So, it may be way too expensive, but you can’t deny that the Acer Predator Aethon 500 is one attractive gaming keyboard. Its aluminum chassis looks and feels premium, and the metallic keys only add to the appeal. There is a button in the top left corner of the keyboard that switches between predetermined RGB lighting effects and a volume wheel that extends beyond the chassis on the top right. You can customize the RGB lighting beyond these packaged effects, if you so please, but it’s going to take some doing. You’ll have to download the software, and for some reason it’s not very convenient to find – we had to do some digging online to find it, and we’ve included the link to the download here. This software also allows you to mess around with macros if you’re feeling frisky, but because the macro keys are placed directly to the left of the regular keys, we don’t really use them all that much — we keep hitting them on accident, especially in the middle of frantic Battlefield matches. We don’t know why Acer couldn’t just link to the software on the product page like every other manufacturer on the planet — especially when it’s so crucial to using the keyboard on a day to day basis. Acer is already asking for an arm and a leg for a keyboard that arguably isn’t worth it, the least it could do is make the software easy to find. Then, there’s the wrist rest. Acer didn’t really need to include it in the package, but man, it’s uncomfortable. Rather than being padded in any way, the wrist rest is made of this rigid plastic that was arguably less comfortable than not using a wrist rest at all. We don’t get it: this is priced like a premium device, everything attached to it should at least be competent, right? The design on its own would be fine in a keyboard that costs half as much as the Acer Predator Aethon 500, but when you’re spending this much money on the keyboard you should demand only the utmost quality. You could literally buy 16GB of DDR4 RAM instead – the RGB stuff, too. As is the common theme with the Acer Predator Aethon 500, it performs well, but not quite at the level we’d expect at its price range. The Kailh Blue switches are fine, and we didn’t run into any problems while playing games. But, because these switches are basically Cherry MX Blue knockoffs, they’re awful at productivity work. They’re both loud and uncomfortable, which is a combination that isn’t going to win it any wistful looks in an office environment. With 50 grams of actuation force needed and 1.9mm of travel, the Acer Predator Aethon 500 is just as ‘fine’ on paper as it is in practice. This keyboard is going to get the job done, but it’s really not much to write home about. At least it features all-key rollover, and the switches are rated at 70 million keystrokes. While testing this keyboard, we are playing some Battlefield 1 – a game that almost requires a decent keyboard, what with all the different commands you have to give. And, we don’t notice anything holding us back at all. You’ll be able to rely on this gaming keyboard to get the job done, which is something we would assume given its price. If you can find this keyboard on a deep sale for, say, $99, then you’re going to get one hell of a keyboard that has all the features you really need. However, at its list price, the Acer Predator Aethon 500 is just not up to snuff. With its knock-off key switches, obscure software and uncomfortable wrist rest, it’s extraordinarily hard to recommend this keyboard to anyone. Even for users that are irrationally attached to the Acer Predator brand and aesthetic: just go out and buy a set of stickers or something. 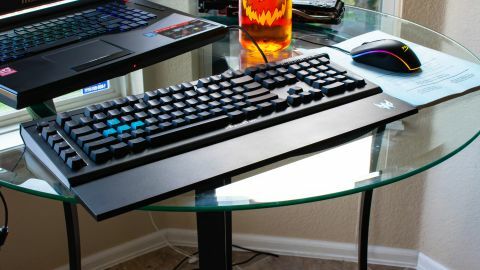 This is a keyboard that does the bare minimum that a decent gaming keyboard should strive for, and at almost 200 bucks, it just isn’t enough. If you’re willing to spend this much money, you might want to look elsewhere for your gaming keyboard needs.